(Waterloo, IN) – The Town of Waterloo is pleased to announce they have received a development plan for a Casey’s General Store to be constructed at the corner of US Highway 6 (Union Street) and CR 427 (Wayne Street) in Waterloo. Town leaders believe this is a positive step toward revitalization in downtown Waterloo. The Main Street committee and Redevelopment Commission have been focusing on revitalization in downtown Waterloo for several years by planning events and providing façade or improvement grants for renovations. Most recently, they are working with Ball State graduate students on a Community Based Project conducting research and gathering public input that will lead to recommendations for what types of business to attract to downtown. Headquartered in Ankeny, Iowa, Casey’s is the leading independently owned convenience store chain in the Midwest and one of the largest in the country. 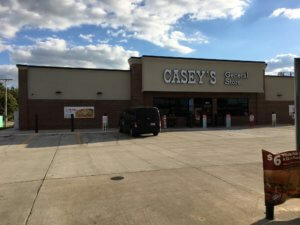 Casey’s General Stores, Inc., owns and operates over 2,000 convenience stores in 15 Midwestern states. Approximately 57% of their stores are located in communities of 5,000 population or less. The stores offer self-service gasoline, a wide variety of grocery items, and prepared foods, such as made-from-scratch pizza and donuts, chicken tenders, and sandwiches. Casey’s owns and operates two distribution centers, including one located in Terre Haute, IN, delivering approximately 90% of in-store products as well as approximately 75% of the fuel sold at their stores. Visit http://www.caseys.com to find more information on careers, community involvement, product offerings, coupons and more.